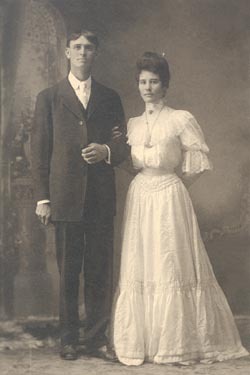 On Wednesday, October 10, 1906 Andrew Jackson Lummus and Laura Francis Warren traveled to Waxahachie, the county seat of Ellis County, Texas. Standing before E. P. Anderson, Jr., Justice of the Peace Precinct 1, they were united in marriage. Jackson was 23 and a farmer. Laura was 20 and a homemaker. Jackson was born in Blue Springs, Mississippi on Sunday, March 11, 1883 to Robert Silas and Sarah Bell (Hardy) Lummus. Sarah died in 1887, and Robert remarried. In about 1892 the family moved to Texas living first in Temple then Hillsboro before moving to Ennis in Ellis County in 1895. At the time of the 1900 Census Jackson lived with his parents and siblings on a farm near Ennis. His occupation was listed as farm worker. Laura was born on a farm near Alma in Ellis County on Friday, November 20, 1885 to Henry G. and Anna Elizabeth (Jayroe) Warren. Henry Warren died on February 19, 1900, five days after his 40th birthday, leaving Anna to rear four young girls. Etta, the oldest, was married, and living with her husband and one child on a farm next to her parents. At the time of the 1900 Census Laura was the oldest daughter living at home. She was listed on the census as attending school. Jackson and Laura made their home in Ellis County. Laura gave birth to four children: Thelma Lee was born on Tuesday, August 4, 1908; Floye Loraine on Sunday, November 13, 1910 (died on December 19, 1912); Hadgie Sue on Friday, February 21, 1913 and Jack (Andrew Jackson Jr.) on Friday, October 22, 1915. Thelma, the oldest of the Lummus children, was the first to marry. On Saturday, September 5, 1931 she eloped with Thomas Gilbert Wright to Oklahoma to be married by a justice of the peace. They made their home in Alma, Texas. Sue married Dorsey Thomas Merritt on Monday, May 21, 1936 in Ennis, Texas. Tommy was employed by Matson Steam Ship Company in Los Angeles. They made their home in Los Angeles, California. On December 8, 1941 at 4:10 p.m. President Franklin Delano Roosevelt signed the declaration of war against Japan. Matson Steam Ship Company, vital to the war effort, closed its' commercial operations laying off civilian employees. Tommy found employment outside of Los Angeles. Jack joined the U.S. Marine Corps Reserve in Dallas on January 30, 1942. Gilbert followed Jack into the Marine Corps on February 19, 1942, and Tommy joined the U.S. Army Air Corps sometime during the last half of 1942. Thelma and Sue, with one child each, moved back to the home of their parents. Late Saturday evening on May 13, 1944 Jackson died. At the time of his death he was Assistant Chief of Police for the City of Ennis, Texas. Jackson worked the night shift. He was seated at the counter of a small café at 110 North East Main Street in Ennis drinking coffee, when a disturbance erupted. Oran L. Mounts, a special agent for Southern Pacific railroad, was eating supper at one of the tables. He was drunk, but in control until he became irritated with one of the customers. His voice rose above the din of the café issuing loud insults to bully the man. Jackson knew Mounts. They had worked together on railroad and city police matters. Jackson coaxed Mounts outside and in front of the lighted café. He placed his right hand on Mounts' left shoulder, and was talking kindly to calm him. Lights from the café streamed onto the back of Mounts, and into the face of Lummus. Suddenly, and without warning, Mounts' right hand moved inside his unbuttoned coat for his revolver. Within seconds he had shoved the barrel into Lummus' stomach pulling the trigger. Jackson crumpled to the sidewalk. An ambulance was called. The driver and an assistant lifted him onto a gurney with collapsible legs that slid easily through the rear opening into the interior. When the heavy rear door was closed, it was quite and peaceful inside, but Jackson was dying. He was mortally wounded. His life stopped at 10:30 p.m. inside the ambulance on a blood stained gurney with siren wailing as it sped down deserted streets toward Ennis Municipal Hospital. He was 61. In less than 10-months Jack would die from wounds suffered in the Battle for Iwo Jima in the Central Pacific theater of war. While leading his platoon in combat his foot came down on the detonator of a land mine, and he was mortally wounded. On Thursday afternoon, March 8, 1945, while on an operating table in 5th Marine Division Field Hospital near the east beach on Iwo Jima, his life stopped. He was 29. In the early morning hours before dawn on Wednesday, February 21, 1968 Laura Francis Lummus died peacefully in her sleep in her home at 302 West Waco, Ennis, Texas. She was 82. Hadgie Sue (Lummus) Merritt died after a short illness at Harris Hospital in Ft. Worth, Texas on Saturday, May 26, 2001. She was 88. Tommy preceded Sue in death on January 20, 1990 after a long illness. He was 79. Thelma Lee (Lummus) Wright died at approximately 3:00 p.m. on Thursday, January 3, 2002 in Denver, Colorado. She was in poor health the last few years of her life, but died peacefully in her sleep. She was 93. Gilbert preceded Thelma in death on December 27, 1990 after a long illness. He was 84. Jack, and his parents and siblings are gone. The sons and daughters, nieces and nephews, and other relatives and friends live on with fond and vivid memories of the Lummus family. Our memories are all that is left of their lives, and will reside in our minds and hearts for as long as we shall live.